I’m always tempted by new plants when I visit garden centres and nurseries, perhaps it’s simply that they always have something flowering to sell when my own garden has a few sparse areas going begging. Or the fact that something seems so unusual that I feel I may be able to find a perfect gap for it at some point in the far distant future. With garden centres having excellent flowering plants at the moment it is easy to get carried away. Plants do have to look good in a garden but more importantly they have to fulfill a role for most of the year, this is especially true of shrubs that can provide form and structure even when not in leaf. So before heading off to the garden centre consider what roles your intended plant purchases should fulfill, including intended sizes and location. As importantly what are the surrounding plants like, shrubby, herbaceous or groundcover perhaps? If your established plants provide summer colour then why not consider introducing an autumn or winter interest to that planting scheme? Even if the plant you buy isn’t amazingly interesting now, think of the difference it may make to your border at other times of the year when the other plants aren’t growing or flowering. This may seem rather obvious but having guidelines for your plant purchase makes life so much easier. Flowering plants at garden centres sell much easier than anything else and so the chance of us gardeners buying unsuitable plants is actually quite high. If you are starting a new piece of planting and stuck with what to buy then it can be almost overwhelming at the garden centre and the chance of impulse buying is easy. 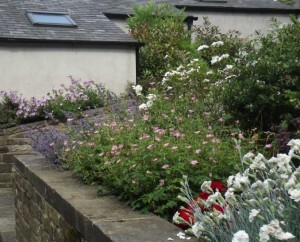 Remembering that colour and structure make a good border is really helpful. Shrubs that maintain leaf colour through the whole year are excellent starters. Anyone wanting to create a planting scheme cannot go far wrong by starting with a plant such as a basic lavender. They are evergreen and keep their leaf colour through winter. Taking the lavender and finding an herbaceous flowering plant that looks good with it is the start of a planting scheme giving both seasonal colour and year round interest. There are many different plants flowering now so there’s a good choice to essentially mix and match what’s required and what looks good for the future too. It is a good way to create planting but remember to read plant labels and see what conditions they require and their intended sizes. At this time of year new plants need lots of water when planted so soak the plants roots thoroughly in a bucket of water before planting and water on a regular basis until established.